I actually didn't mind this book. I wanted more from lil tho. I wanted the ending to be different. I just expected more. Wonderful romantic story. Loved the additional novella. Real love never dies. Snowed in during Christmas in a cozy little cabin with a love for the past; Awesome! Lil wants some alone time because her ex is getting married, and the whole town is looking at her with sad looks; even though Lil was the one who broke it off with him. Casey goes up to his family's cabin to retrieve his stuff because he is leaving town because his dad is a jerk, and Casey is tired of it; he is also the brother of Lil's ex, and on his way back into town he gets caught in a storm, but as luck would have it, he is near Lil's cabin, so he takes refuge there. Lil and Casey had a relationship when they were younger, but Casey did some things that negatively affected Lil and his relationship, so there is some awkward tension between them at first, and some hurt feelings. I really enjoyed this! This is a short story, and I think it had good pacing, but I do think it took a bit too long before Lil and Casey began to get over some of their issues; Lil was a bit too bitter for my liking, and I also think the addition of the wedding scenes could have been omitted, but I pretty much loved all the aspects of this story. 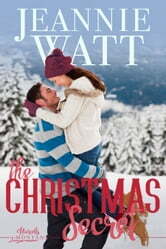 I love second chance romance during Christmas stories, and add in the stranded in a cabin, and I love it even more! I liked the backstory for Lil and Casey, and I think they were really cute together, and Casey is adorable. A short, sweet romance! Lil goes to her cabin for the Christmas holidays to get away from her family and ex-fiance. A blizzard blows in an unexpected visitor. Interesting family dynamics.